With Okta and OpenID Connect (OIDC) you can easily integrate authentication into a React Native application and never have to build it yourself again. 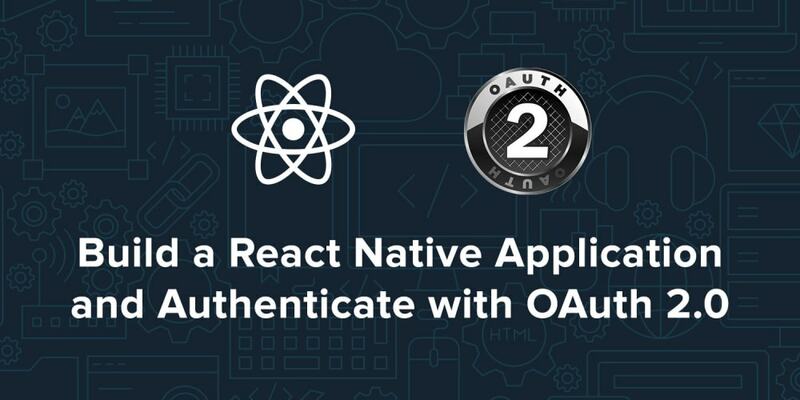 OIDC allows you to authenticate directly against the Okta API, and this article shows you how to do just that in a React Native application. I’ll demonstrate you how to log in with OIDC redirect, using AppAuth. Today I&apos;m going to show you how to develop a React Native app with the latest and greatest releases. At the time of this writing, that&apos;s React 16.2.0 and React Native 0.52.2. You&apos;ll create a new app, add AppAuth for authentication, authenticate with Okta, and see it running on both iOS and Android. You&apos;ll find the QR scanner on the Projects tab of the app. If you&apos;re on a Mac, press i to open iOS emulator. You will be prompted to install/open with Expo, then presented with the rendered App.js. If you&apos;re on Windows or Linux, I&apos;d suggest trying the Android emulator or your Android device (if you have one). If it doesn&apos;t work, don&apos;t worry, I&apos;ll show you how to make that work later on. In this example, I&apos;ll use React Native App Auth, a library created by Formidable. The reason I&apos;m using this library is three-fold: 1) they provide a nice example that I was able to make work in just a few minutes, 2) it uses AppAuth (a mature OAuth client implementation), and 3) I was unable to get anything else working. I tried react-native-oauth, but discovered it required using an existing provider before adding a new one. I only wanted to have Okta as a provider. Also, it&apos;s high number of issues and pull requests served as a warning sign. I tried react-native-simple-auth, but had issues getting the deprecated Navigator component to work with the latest React Native release. Before you add AppAuth to your React Native application, you&apos;ll need an application to authorize against. If you don&apos;t have a free-forever Okta Developer account, get one today! Log in to your Okta Developer account and navigate to Applications > Add Application. Click Native and click Next. Give the app a name you’ll remember (e.g., React Native), select Refresh Token as a grant type, in addition to the default Authorization Code. Copy the Login redirect URI (e.g., com.oktapreview.dev-158606:/callback) and save it somewhere. You&apos;ll need this value when configuring your app. You&apos;ll need to "eject" the native configuration for your app, which is normally hidden by create-react-native-app. TIP: If you see a "Command link unrecognized" error, run npm i && react-native link. After running these commands, you have to configure the native iOS and Android projects. I&apos;ve copied the steps below for your convenience. Then run pod install from the ios directory. This can take a while the first time, even on a fast connection. Now is a good time to grab a coffee, or a scotch! This property holds the authorization flow information that started before you redirect to Okta. After Okta authorizes you, it redirects to the redirect_uri that&apos;s passed in. Setting up Android is quite a bit easier. React Native App Auth for Android depends on AppAuth-android, but you need to add the correct Android Support library version to your project. Make sure to adjust the initialization of AppAuth with your settings. This code uses styled-components, so you&apos;ll need to install that as a dependency. Then copy the components directory into your project&apos;s root directory from Formidable&apos;s example. Grab the background image that&apos;s referenced in the Page.js component too. You should see a screen that says "Hello, stranger." Click on Authorize and you&apos;ll be prompted to continue or cancel. Click Continue and you should see an Okta sign-in form. Enter your credentials and you&apos;ll be redirected back to the application. To fix this, open Android Studio, choose open existing project, and select the android directory in your project. If you&apos;re prompted to update anything, approve it. If you get an error Could not find method google(), edit build.gradle to remove this line, then reload the project. Modify android/build.gradle to add google() back in, then run npm run android again. You should see a welcome screen and be able to authorize successfully. Or, you can just change your package.json to have react-native": "0.52.2 and then run npm i. If you&apos;d like to get an ID token in addition to an access token, add idToken as a property of type State and the state variable in App.js. Then update the authorize() method to set the property from authState. You&apos;ll want to do add similar logic in the refresh() and revoke() methods. To see what&apos;s in your ID token, install buffer. NOTE: There&apos;s a bug in react-native-app-auth that prevents this from working on Android. Run npm run ios and you should see the claims in the ID token after authorizing with Okta. Clone the project from GitHub and checkout the okta branch. NOTE: You&apos;ll need to have Java 8 installed to run this Spring Boot application. TIP: For this to work in the Android emulator (and on a real phone), you&apos;ll need to change localhost to your IP address. In iOS Simulator, press Command + R (on Mac, CTRL + R on others)to reload everything and you should see the JSON when you click on the Good Beers button. You can reload in Android using Command + M (on Mac, CTRL + M on other operating systems). I hope you&apos;ve enjoyed this whirlwind tour of how to do authentication with Okta and React Native. You can learn more about React Native on its official site. You can also add to its ~60K stars on GitHub.